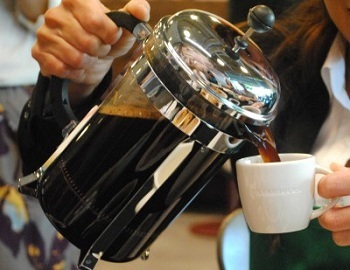 New research suggests that coffee drinkers live longer than con-coffee drinkers. If that’s true, I could probably live forever. The study looked at more than 400,000 men and women between the ages of 50 and 71, and those with some preexisting conditions – cancer, heart disease and stroke – were excluded were excluded from the study. The results were surprising. The study found that men who drank 2-3 cups of coffee a day had a 14 percent lower risk of dying from heart disease, 17 percent lower risk of dying from respiratory disease, 16 percent decreased chance of dying from stroke and a 25 percent lower risk of dying from diabetes than those who drank no coffee. Women faired similarly. Those who drank 2-3 cups a day had a 15 percent lower risk of dying from heart disease, 21 percent lower risk of dying from respiratory disease, 7 percent decreased chance of dying from stroke and a 23 percent lower risk of dying from diabetes. Results improved for those who drank more coffee, too.